These photos were taken in the first week in June 2012 at close to 12 noon. The location was in the garage area of a large building in Crystal City, Virginia. The "Take It!" came from a long overdue moment taken to take a closer look at something I had been passing by on a frequent basis. It was a new covering over a wall of windows which allowed just enough light in while providing a huge measure of privacy for those where offices were formerly exposed. 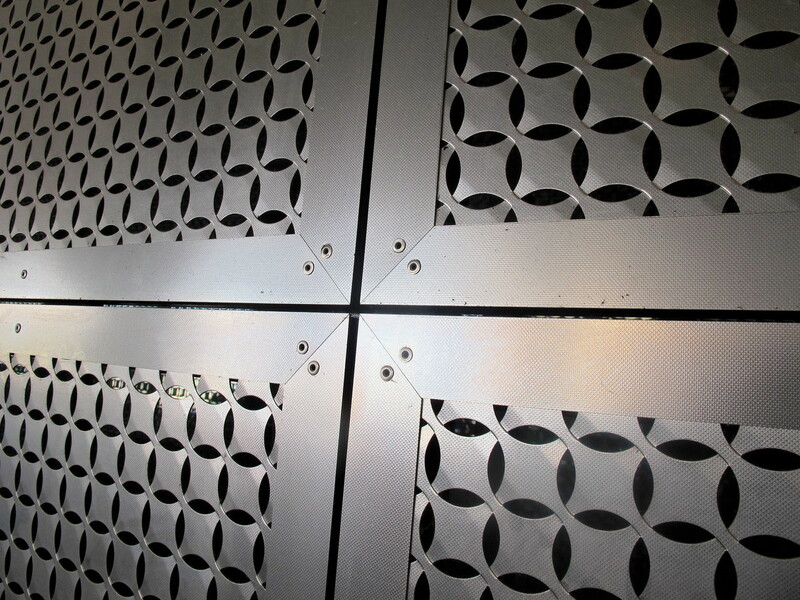 I decided to get up close to look at the design on the panels and was quite surprised with the detail presented. As you can see, this is not just some wall it is a display of artistry for each hole in the steel is part of a pattern of stampings that must have taken the makers a long time to produce. I took one shot of the stretch of this fine work and another of a place in the work where four panels came together. The After Take: It was while reviewing these photos at the place where I have prints made, that I thought there might be some fun attached to the final print. I was quite happy with the way each shot came out. Especially the close up with the brightness shown at the junction of the panels. The intricacy of the stampings is also a joy to see higlit by this photo. All whom I had the opportunity to show these shots thought they were quite cool, with some even giving the close up a designation of being rather artsy. These photos are another example of what has become a very recurrent theme for me. That being to slow down a bit and take time to look at some of the small stuff, in it one can often see splendor. Should anyone from either the mfg of this masterpiece or the people who were thoughtful enough to put it into place read this. I want to pass along the kudos' I heard from all who looked at this fine work. Here is hoping you enjoy the photos and the artistry display they present. I feel very lucky to have stumbled upon this eye candy. PS: Part of the pleasant challenge often faced with the presentation of multiple photos, is to make that decision as to which will be the featured photo that everyone sees first. Very fitting title; curious that such a design was found in a garage. Very cool looking design. Clean look. Hi Teri: Your comment calls for a note of clarification. 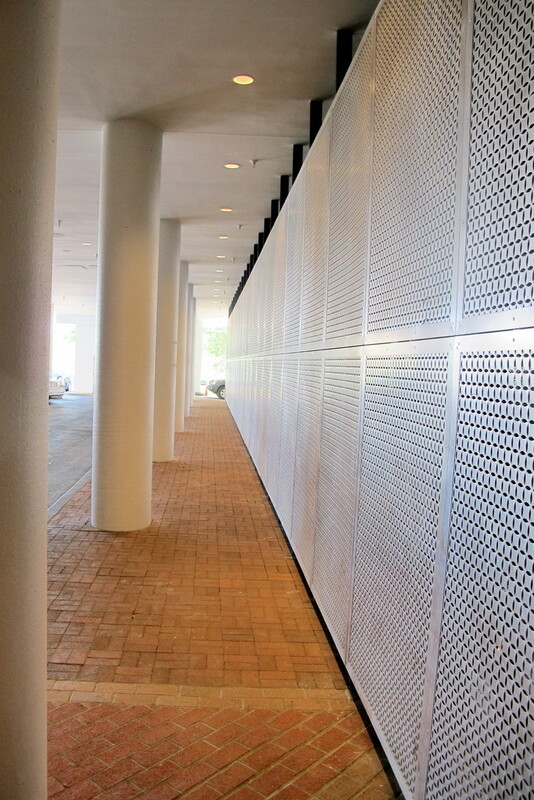 This wall is covering a row of offices that I believe wanted some privacy but keep some light coming through. I think they got the privacy, but not much light. Hi Gabe: I too would not mind having this in my garage,first I would need to have a garage, lol.